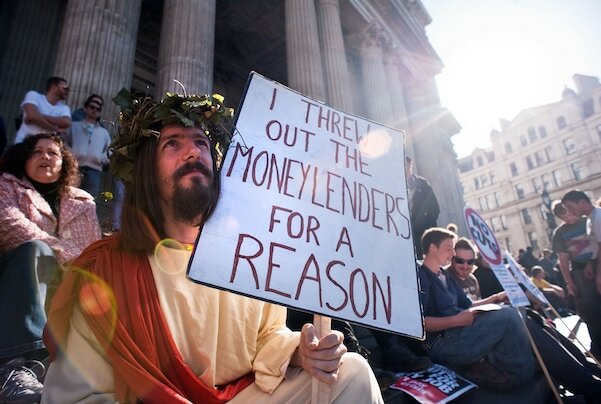 When Jesus drove the moneychangers out of the Temple in Jerusalem, he took on the brokers who were ripping off the pilgrims who came during Passover. These brokers (bankers) were in cahoots with the priestly class who ran the Temple and together they would cheat pilgrims out of the just price of their offerings. The bankers would sell their own Temple coinage in exchange for foreign money, charging interest on the transaction. The Temple in Jerusalem was in a sense the national bank of Israel in Jesus’ time; it was a powerful national treasury that did not let its great wealth sit idle. The bank lent the money it collected at interest, violating Jewish tradition on lending, especially lending to the poor. These unjust lending practices drove many residents into extreme poverty and created the vast slum dwellers of Jerusalem. When you #OccupytheBible on money, this is the text where you need to start. There is a prophetic tradition on charging interest in the Hebrew Bible that Jesus is drawing on to challenge these unfair lending practices. Our current economic crisis is really a credit crisis, a crisis generated by the way banks decided to change their lending practices and it effectively crashed the system.